Two years after Ebola, the World Health Organization continues to push forward with a thorough overhaul of how it responds to health emergencies. These include Public Health Emergencies of International Concern (PHEICs), such as the Ebola and Zika outbreaks, as well as natural diseases, conflicts, refugee crises, and the like. While the organisation has historically emphasised its normative mandate, it is now taking on new operational responsibilities. It will play a more direct and active part in coordinating on-the-ground responses to future health emergencies (although it still will not act as a direct service provider, à la Médecins Sans Frontières). WHO is making this shift in response to the overwhelming criticism of how it handled Ebola. Reforms have been guided by the recommendations of numerous review panels set up by WHO itself, the UN Secretary General, and outside actors to analyse what went wrong with Ebola. At the 69th World Health Assembly, taking place from 23-28 May, two major reform initiatives were on the table: strengthening the International Health Recommendations (IHRs) and creating a new agency structure – the Health Emergency Program (HEP) – that will be responsible for directing the agency-wide, multilevel response to health emergencies. The IHRs are a legally binding set of regulations that govern how states, and WHO, are supposed to response to public health emergencies. States are supposed to strengthen their surveillance and response capacities so that they can detect new outbreaks and move to stop their spread. However, nearly a decade after the regulations went into effect, only 32 percent of states have complied with these requirements. Most of the non-compliers are developing countries with weak health systems that lack the necessary capacity and resources. States are required to report possible PHEICs, such as cases of infectious diseases like pandemic flu or unusual health events, to WHO. From there, the director general is responsible for convening an expert advisory committee to decide whether the event in question does constitute a PHEIC. If so, the director should make recommendations for how affected countries should response and whether other countries should impose restrictions on trade and travel with affected countries. Importantly, states are not supposed to impose restrictions in excess of those recommended by the DG, to avoid unnecessary harm to the economies of affected countries. However, in practice, they often do and this often discourages states from reporting possible PHEICs. 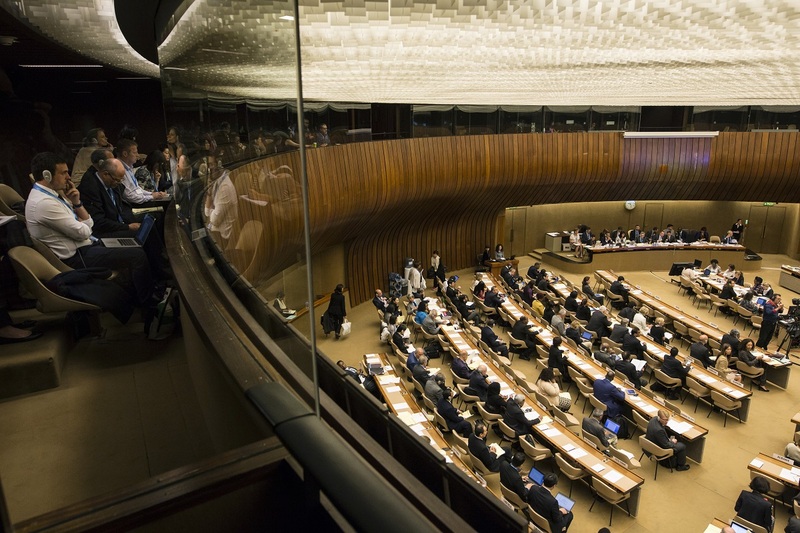 The first set of reforms discussed at WHA 69 stemmed from the recommendations of the Review Committee on the Role of the IHRs in the Ebola Outbreak Response. The committee, chaired by Didier Houssin, president of the French Agency for Food, Environmental and Occupational Health and Safety, was tasked with examining how well the IHR functioned during the Ebola outbreak and what can be done to strengthen their performance in the future. The Committee’s report [pdf] made two sets of recommendations. The first contains several major new strategies for promoting IHR compliance: designing a new Global Strategic Action Plan for IHR implementation; promoting joint external evaluation of IHR core capacities, rather than relying on states to self-evaluate their readiness; creating International Public Health Alerts, an intermediate alert category for risky situations that do not rise to the level of a PHEIC (the ongoing yellow fever epidemic in Angola and Democratic Republic of Congo would presumably be an example); and establishing a standing advisory committee to review possible public health alerts or emergencies. The second set of recommendations proposed ways of “reinforcing existing approaches” to IHR implementation, including strengthening national IHR focal points, prioritizing implementation support to the most vulnerable countries, and do more to ensure that states are aware of any recommended trade and travel restrictions and do not exceed these recommendations. However, Brazil, Russia and India expressed reservations and asked for more time to consider the proposals. Among other concerns, Brazil was worried that new approaches would have to be incorporated into national laws; India wanted more clarification on how the intermediate alert category would work; and Russia expressed doubts about the joint external evaluations. In the end, DG Chan proposed a compromise that was acceptable to all member states. For the sake of swift action, she will move forward with implementing the recommendations that reinforce existing approaches within the IHR (i.e. approaches states have already approved). The secretariat will also produce a draft strategic plan for implementing the new approaches, which member states will have a chance to discuss and provide feedback on in their regional meetings. This feedback will be incorporated into a new proposal to be discussed during next year’s Executive Board meeting and the 70th WHA in May 2017. HEP embraces an all-hazards approach and consolidates all WHO’s emergency response activities within a single program “with one clear line of authority, one workforce, one budget, one set of rules and processes, and one set of standard performance metrics” [pdf]. It creates a standing interdepartmental task force at the global and regional levels, with a common structure at both levels to promote coordination and information flow. During deliberations, developing states consistently reiterated that the HEP’s top priority must be country capacity building and health systems strengthening, rather than consolidating resources in Geneva. Delivering the secretariat’s response, Bruce Aylward, interim executive director, Outbreaks and Health Emergencies, reassured them that 75 percent of additional staff and funding will be directed to the regional and country levels and allocated in line with where the crises are. However, reforms do not become reality without funding and, as usual, this is where conversation lost momentum. The HEP requires $160 million for 2016-17. Many experts agree that WHO’s budget is vastly, disablingly underfunded. Speaking at a side event, Tim Evans, senior director for the Health, Nutrition and Population Global Practice at the World Bank, questioned how WHO can be expected to fulfil its massive and increasing global mandate with a budget roughly the size of the New York City Health Department’s. But other states hedged. Mexico “observe[d] with concern the intention to increase the existing budget without an exhaustive analysis of current spending and resources.” To this, Aylward responded that this analysis is already provided in other WHO documents. And Spain proclaimed that it “cannot support any increase in contributions without the DG having made a tangible effort” to find the money elsewhere, perhaps by cutting travel expenses. And the recent past is not a promising prologue. Last year, WHO established an emergency contingency fund to provide rapid assistance to states during health emergencies. This fund has already proven valuable in combatting Zika and natural diseases caused by El Niño, yet WHO has only been able to raise $26.9 million against a $100 million endowment target. In the absence of voluntary funding (or an increase in assessed contributions) from states, WHO relies on non-state actors to fill the funding gap. Private philanthropies and public-private partnerships are among the organisation’s largest voluntary donors. Yet there is reason for concern over the sustainability of this approach. He who holds the checkbooks holds power and, as the WHO negotiation for a Framework for Engagement of Non-State Actors (FENSA) demonstrates, states are increasingly concerned about the conflicts of interest that may arise from non-state actor involvement with WHO. Meanwhile, speaking at a side event, Chris Elias, president of the Global Development Program at the Bill & Melinda Gates Foundation (BMGF), made it clear that Gates funds WHO when and where its activities align with the Foundation’s own strategic priorities. The implication is clear: states cannot rely on BMGF or other private donors to just foot the bill for their shopping list. And when told BMGF contributions account for 20 percent of WHO’s 2016-17 budget, Elias’ immediate reaction was “Oh boy”. Mara Pillinger is a PhD candidate at George Washington University, a Junior Visiting Scholar at the Global Institute for International & Development Studies, and a researcher at Intellectual Property Watch. She tweets @mplng. "WHO Reforms Health Emergency Response But Who Will Pay The Bill?" by Intellectual Property Watch is licensed under a Creative Commons Attribution-NonCommercial-ShareAlike 4.0 International License.